Imagine the Gulf 120 feet shallower than it is today and a shoreline far to the south of the current coast. Environmental Reporter Ben Raines recently dove down 60 feet, 10 miles from shore to explore an Ice Age forest. 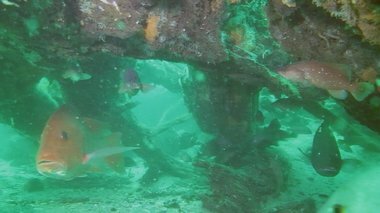 Ancient forest lies 10 miles off the Alabama coast (video, gallery) | al.com: Sixty feet beneath the green waves of the Gulf of Mexico, ten miles from the nearest land, stands an ancient forest of giant trees.